На странице представлен выбранный Вами товар 250 Forever Stamps First Class Postage USPS Patriotic Spiral MINT $125 Value. We have extremely good feedback and take care of our clients. Orders typically ship within 24 hours for a quick turnaround. Feedback has praised my shipping times. I hope you will be happy too. This listing includes brand new, mint, 25 books of 10 Patriotic Spiral stamps for a total of 250 as pictured. You get 250 actual Patriotic Spiral stamps, and not a last minute mixture of some other Forever stamps, as many other listings do here on EBay. No games. First class stamps are now $.50. To buy equivalents at the post office, it would cost $125. Individually, these will mail a 1oz USPS letter envelope, even with the recent price increase. 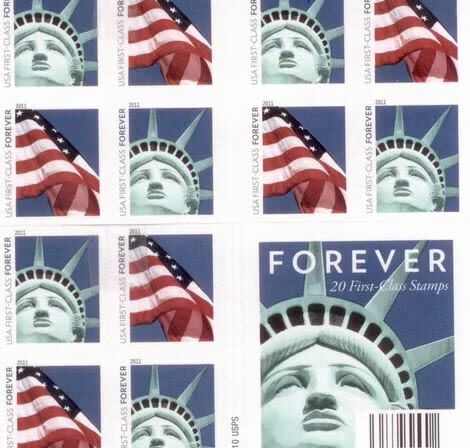 Forever stamps are "forever", and can always be used with USPS, regardless of the recent price increase. Save over 20% on shipping with this great deal. Orders will be shipped with a tracking number. Message me with questions. Satisfaction is guaranteed. 100% SATISFACTION GUARANTEE! Message us with any concerns or questions and we'll take care of you right away. FREE SHIPPING inside the USA with Tracking! PayPal is the preferred payment method. Message us for alternative methods.